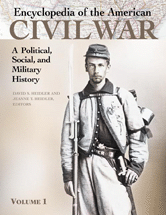 Editors: Heidler, David S. and Heidler, Jeanne T.
Written by scholars, the essays are both authoritative and easily accessible to history buffs, students, and general readers. Brief entry bibliographies lead curious readers to the most reliable sources for further information. Includes maps, primary source documents, and chronology.